I thought it would be easy to find a detail on the net for a garage that has to have part of its floor level under ground level but It appears I'm a search numpty. I need a garage that I can drive into so the front of the garage has to be at ground level - however the ground must rise on the outside of the garage as it it goes on to another garage at a higher level (300mm min). The garage(s) are to built on a raft foundation (eng designed - which I will call a slab) but will be principally 100mm block with piers with a chunky black feather-edge cladding to match the neighbours existing garage. The garages will be open fronted so highly ventilated. The ground material above slab level can be a no fines fill. I'll want the garages to look right so cladding coming down to a brick plinth is an option - or to blockwork painted black to which the cladding has been fixed. I am assuming that there will be membrane below the slab and a dpc (maybe stepped) at some point above ground level. Do I need to worry about frost damage to the block work below ground level. Will the no fines fill protect against permanently damp blockwork at the back of the garage. Or do I need to get the slab membrane up the outside of the wall to above ground to create a tank - if so how do I protect it in the gap between the ground and the cladding. I have a semi-buried garage similar to what you describe. I imagine it is well tanked outside, because it is bare blocks inside, and I have never seen the slightest sign of dampness. I have my lounge above. The EWI stops about 22 cms below the level of the garage roof soffit. I now need to EWI the garage facade piers and reveal, as they represent an enormous cold bridge. For outdoor garage I wouldn't bother with poly dpm, presumably snow and rain can land on the disband wet vehicles drive onto it. I would bo brick plinth and timber frame on top, blocks seem ott. I can't see frost being a problem, it will go very dry underneath so not much wet to freeze anyway. I would dig out the area, lay slab, build 450mm high brick walls (300 + 150mm) using engineering bricks below eventual ground level, paint on tanking below ground, back fill with stone free soil after finishing garage. I'd probably build the wall two bricks thick with no cavity. Not sure piers would be needed. 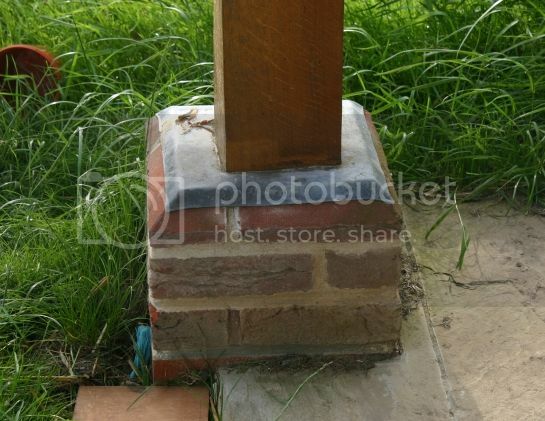 I'd use plinth bricks for the top outer course..
DPC on top of plinth before the timber frame. Before cladding add lead flashing down over the top 20mm of the slope on the plinth bricks for frost protection..
Plans for the roof? Need something to prevent racking in high wind? Perhaps make the door narrower than the garage so there is a return either side? Clad frame with 12mm WBP or OSB? My initial thoughts was to match the roof with the house (40 degree pitch, slate) and if it was not too expensive use attic trusses and create a usable loft/shed above the garage (we will have no loft in the house). The garage outside dimensions will be 6m x 6m so a return at the garage entrance (no door) is easy. Is this still better brick plinth + timber frame + osb skin or is brick plith + block going to be much more expensive? oh - and I was going to get the electricity and gas meters in/on the garage also - timber shouldn't be a problem here though. Posted By: goodevans My initial thoughts was to match the roof with the house (40 degree pitch, slate) and if it was not too expensive use attic trusses and create a usable loft/shed above the garage (we will have no loft in the house). If you are going to use the attic as storage, if it is boarded with OSB this should stop any racking at the front. The other 3 sides have walls so no problem there, is there ? Alternatively if the attic flooring is delayed then racking at the front could be prevented by the installation of a couple of diagonal tensioned wires. For better or for worse the attached drawing is what will be built - the slab has been cast and the dpm under the slab was brought upto the top of the slab. My current thoughts are to cut the membrane down to the bottom of the slab (so as to not create a swimming pool), lash on plenty of bitumen paint (not the dpm stuff but the harder paint) onto the concrete slab edge and lower wall to reduce its permeability but also cosmetic) and surround the foundation with a French drain. In effect relying on a French drain to keep the moisture out (and relying on evaporation from the inside) rather than trying to tank. Is this going to leave me with a damp garage floor and/or lower wall or will the French drain perform miracles? lower blocks will be interfuse ultra 7N. Can you keep soil away from touching the wall? Yes, it can be free draining gravel right up to the surface. Just been down to the site - the shuttering is off - there is no way that membrane is coming off the side of the slab - well bonded in. So the trick will be to ensure good drainage to get free flowing water below slab level.